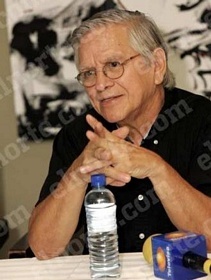 Hector Carrizosa Andrade was born on November 14, 1943 in Monterrey, NL. He began his studies in art with his father Manuel Carrizosa Velasco. He worked with Juan Mingorance, noted painter from Malaga in 1960 same year that he mounted his first exhibition. In 1967 he was awarded First Prize at the Spring Salon organized by the Arte Universal Gallery in Monterrey. In 1978 he held his first international exhibition in Brasil and a year later he moved to Barcelona where he worked for several years. He currently lives back in his native Monterrey and has become a pioneer in Mexican print making with many works in important institutions worldwide.